Australia is as impassioned about its sports as much as its beer. In fact … drinking beer IS sport here …enjoyed as intently every season of the year, but never more so than in summer. 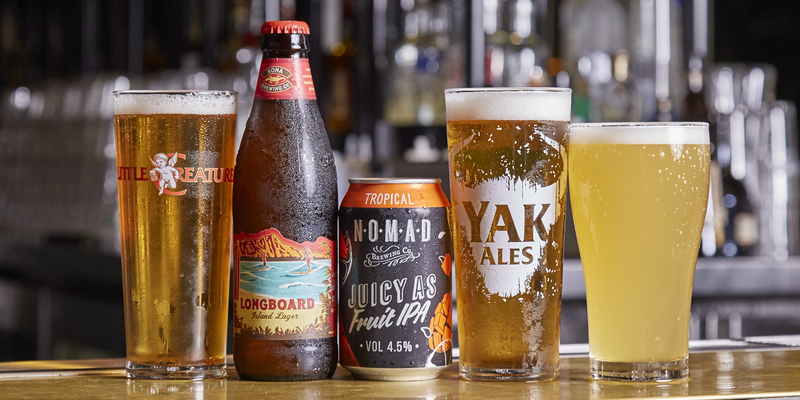 We love summer – not just because it goes hand-in-hand with some of the best beers around, but because it affords us the opportunity to relax, wind-down a little, as well as catch up with friends and family. Honestly, can you name one other beverage that enhances a BBQ or picnic as well? And what better season marries itself so perfectly than with an ice-cold beer? At 4.4% ABV, Dog Days proved to be a hophead favourite when it was first released last summer. A fine, crisp, clean beer, it is refreshing and hoppy. It pours a straw yellow colour with a rocky white head in the glass, with a tropical hop aromas waft. The peachy, juicy-fruit hop flavours marry nicely with the wheat malt. In terms of bitterness, it is firm, but not so intense that it overwhelms the light malt character. FOOD MATCH: Just as at home with barbequed meats as it is with a grilled prawn, mango and couscous salad! At 4.6% ABV this American brew is a smooth refreshing lager fermented and aged for weeks at cold temperatures to yield its exceptionally smooth flavour. A delicate, slightly spicy hop aroma complements the malty body of this beer. FOOD MATCH: Ideal with hamburgers, pizza or enjoyed perfectly on its own. At 4.5% ABV this is a tropical, hoppy and fruity styled Indian Pale Ale. Nomad has taken their “Easy as IPA” and squeezed a whole heap of blood red orange to create their “Juicy As”. Tropical fruits and hop aromas work together highlighting the beer’s smooth malt body. FOOD MATCH: This IPA pairs nicely with spicy dishes or any protein with crispy skin such as roast poultry. At 4.2% ABV, say ‘aloha’ to this fresh and fruity tropical beast. This beer literally tastes like summer in a bottle and offers melon and passion fruit aromas. The flavours in this South Seas Yak sing out like a forest full of parakeets. New world hops nestle together to deliver a unique and refreshing island brew. What food does it dance happily with on the palate? FOOD MATCH: We can vouch for barbecued snapper with a light sauce of olive oil, lemon juice and fresh herbs and a helping of golden roasted potatoes. At the end of the day this is a great Yak to pair with any fresh dish packed with herbs and flavours. At 4.4% ABV this Pacific Ale was inspired by the edge of the Pacific Ocean and brewed using all Australian barley, wheat and Galaxy hops. Pacific Ale pours cloudy and golden in the glass. It is dry hopped to provide a big fruit aroma and a refreshing finish. FOOD MATCH: Pacific Ale goes beautifully with fresh seafood – prawns, lobster, oysters and other fresh fish.